With a lovely weekend such as the one we just had, it was fun to spend it outside, surrounded by great friends and delicious food. Dan and I were invited to an all-day BBQ celebration, hosted by our friends Greg and Rikki who live on Long Island. 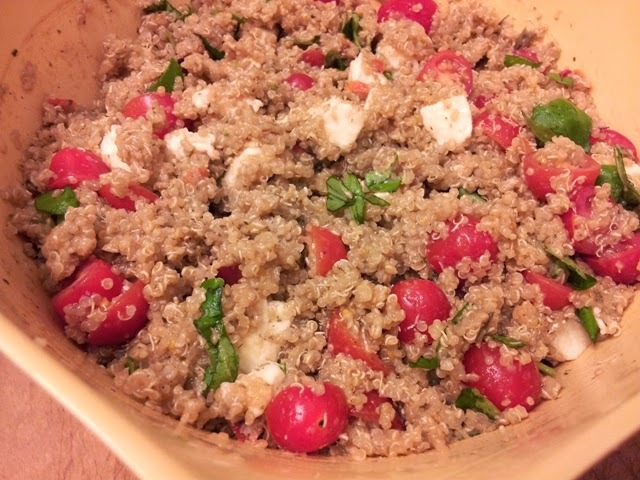 Of course we didn't want to come empty handed, so I whipped up this easy Caprese quinoa salad, while Dan brought with him the ingredients for his famous fried Oreos. Cook the quinoa according to the directions on the box. Let cool for about 10 minutes and then combine with the rest of the ingredients. Fluff with a fork and then dress with more oil or vinegar if needed. Season to taste as needed. Enjoy with your favorite protein or just on its own.